Mother’s Day 2014 here in the UK is on March 30th, so not long now …..
Mothering Sunday is a Christian holiday celebrated throughout Europe that falls on the 4th Sunday in Lent. Secularly, it became an occasion for honouring the mothers of children and giving them presents. It is increasingly being called Mother’s Day, although that holiday has other origins. In the UK, Mothering Sunday is celebrated in the same way as Mother’s Day is celebrated elsewhere. A card and or gift for Mother’s Day is a lovely way to show Mum a little bit of love and appreciation maybe. 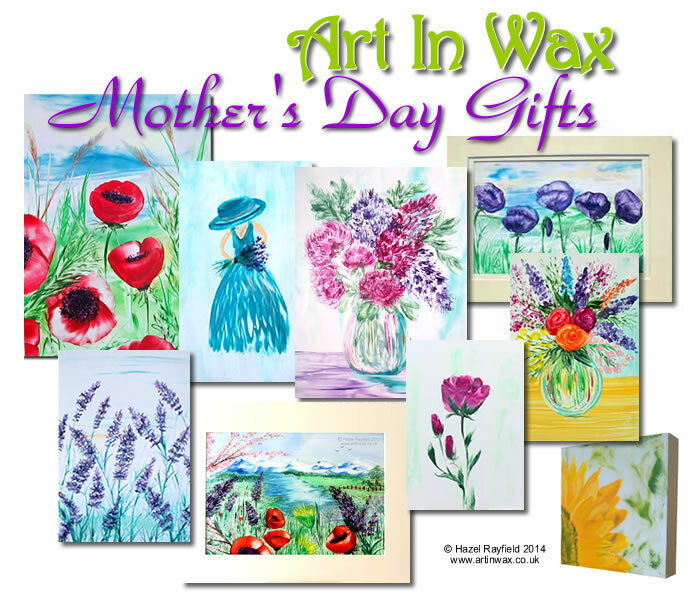 Chocolate and flowers are always appreciated but how about some flowers that will last a lot longer and be a keepsake too ……..
A piece of Art In Wax would make a wonderful gift for Mother’s Day. Lots to choose from and lots of options. From pretty vases of flowers to wildflower meadows, landscape and seascapes, sunsets and much more. Art In Wax comes in many sizes to suit all sorts of budgets. 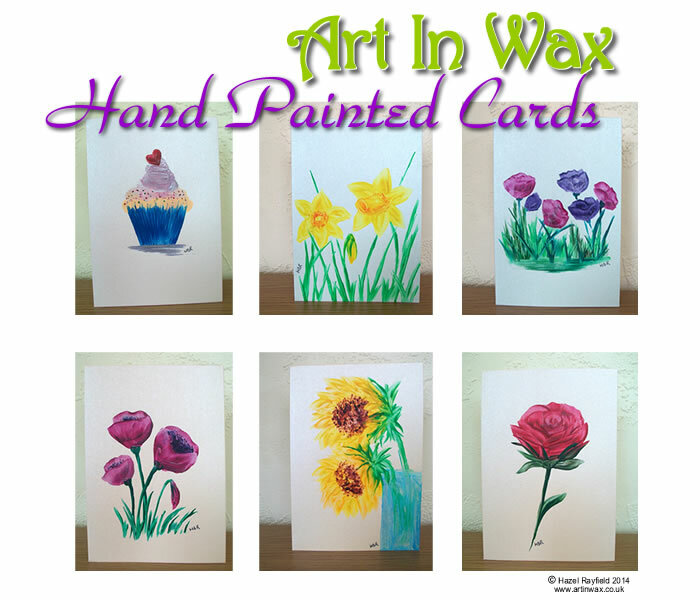 Postcard size art is very popular and a small piece of art with a mini easel can look great displayed like an ornament – no need to frame or hang on the wall. Mini easels are not included with my paintings but are readily available in lots of stores – or I can supply one for a small additional fee – contact me before ordering. Larger pieces of art are available and some come mounted ready to frame, others are just hard backed and can be mounted and framed or just framed without glass, which is great way to display encaustic work as you get to admire the sheen of the wax even more. All art comes cellophane wrapped and with information about Art In Wax. I get great feedback about my artwork. The texture and the sheen of the wax pictures looks do much better in real life, photograph are good to show online but in real life the paintings are do much more! One of the things people tell me the most often is that when they see a piece of Art In Wax how they are amazed that it is made from wax, and how it has been painted using hot wax, the wax has a great texture, sometimes raised sometimes smooth and glossy, colours are vibrant and they have a great sheen which adds to the depth of the picture. 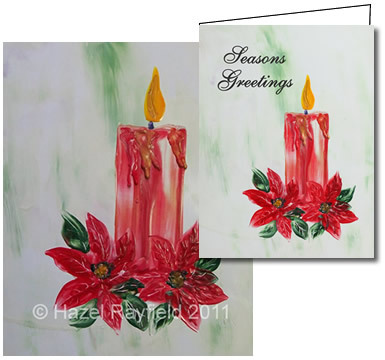 I have just added a range of hand painted original art greetings card to the Art In Wax portfolio of art. Each card is individual painted direct onto 250gsm pearl card stock. As this card is absorbent rather than gloss as with most of my paintings the effect is a bit different but very pretty I feel. A unique and original piece of art on a card makes a great gift on its own but together with a piece of Art In Wax would make a lovely gift and keepsake. Every piece of Art In Wax is unique, some subjects are similar as I love to paint flowers and landscapes but no two paintings are exactly identical. There are lots of places to buy Art In Wax ……..
No two stores have the same pictures as they are all one off so worth checking all the stores to see the art for sale. So if you are looking for a gift, for a special occasion, Mother’s Day, a Birthday, anniversary or just to say thank you maybe why not try something different and give some art as a gift this time …….. Unique and Quirky : A painting of a candle in wax! I recently painted this Christmas candle with some poinsettia flowers using encaustic coloured wax, this wax contains beeswax and when finished I polish the painting to give a beautiful sheen. The painting is A5 in size and has a great texture as I melted the wax to form the ripples of wax running down the candle. This painting has also been featured on TV, you can read about it’s 15 minutes of fame in another blog post “as seen on TV“. Adrian (my husband) photographed my original painting and we added the “Seasons Greetings” sentiment before sending it to be professionally printed. This is the first of my paintings to ever be printed in this way and the results look great, even if I do say so myself! the colours are true and the texture of the wax dripping on the original painting has been captured wonderfully (clever husband, knows his stuff behind the camera) and the gloss card emulates the sheen of the original picture.